There’s no denying that Bali offers the best-looking resorts and villas in Southeast Asia. You can’t get far without seeing infinity pools overlooking jungles or a beach or stumbling across a unique accommodation such as a native hut or treehouse. 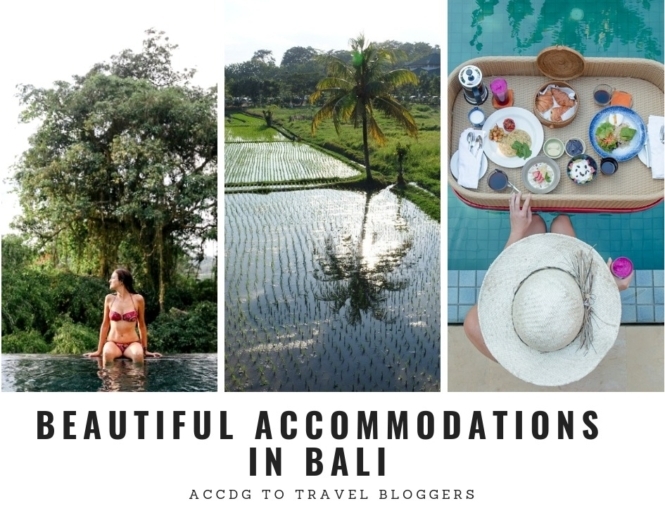 Here we’ve compiled the most beautiful — and Instagrammable — accommodations in Bali, as suggested by fellow travel bloggers. Check this list before booking to up your Instagram game or, you know, just experience the best that Bali has to offer. Tegal Sari is situated about a few meters away from Monkey Forest in Ubud. It has rice-field views, spacious and quiet property, good location, superb customer service and value for money. The hotel was established several decades ago, and over a period of time, the property has expanded to build a number of bungalows housing various types of accommodation. Guests have a wide selection of accommodation to choose from superior rooms with wide verandas and balconies, super deluxe rooms with mosquito-netted four-poster beds and furnished balconies, luxury villas and suites with private swimming pools and kitchenettes, and a Rapunzel-like tower! 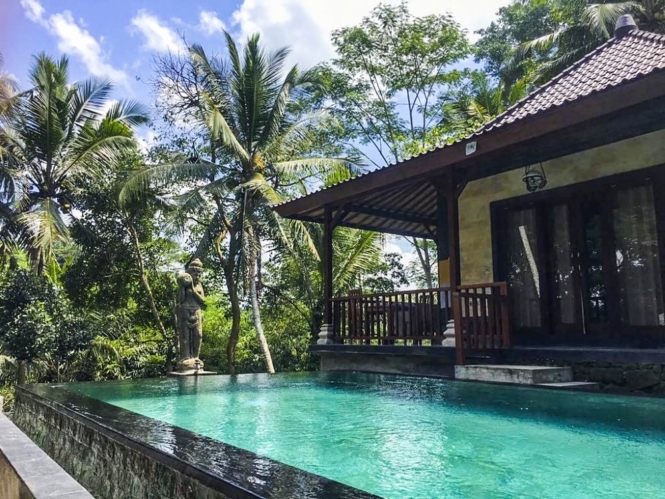 Toya Villa is a hidden gem that is located about 30 minutes north of Ubud center. With only three stand-alone villas and one single room (for one person) that is attached to the main building, Toya is a peaceful haven for those looking for a hideaway on the stunning island of Bali. The resort property is beautifully manicured, the staff is warm and friendly, and the location is perfectly nestled in the jungle surrounded by lush greenery. 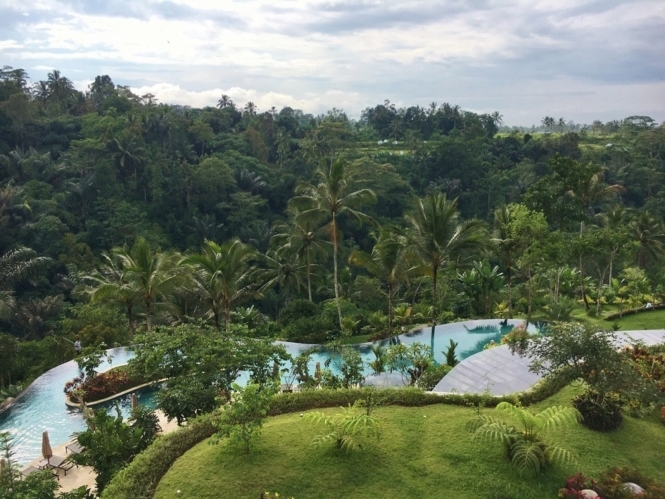 But the best part of Toya is their infinity pool overlooking the jungle — it is absolutely breathtaking! The pool view alone is worth the visit to this stunning property, but the rooms are gorgeous, spacious, modern and luxury for the price tag. 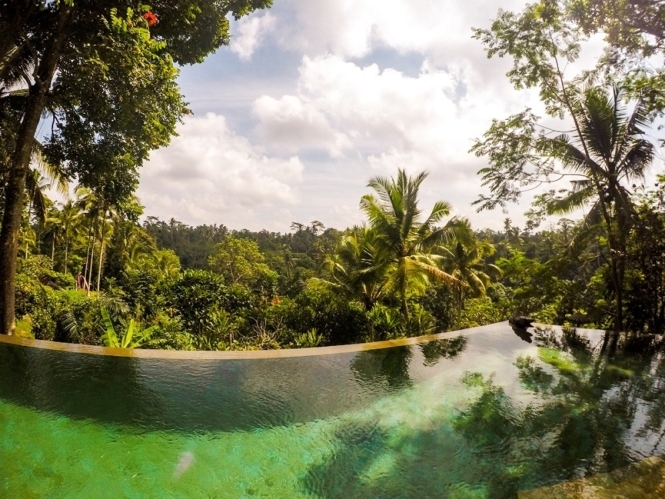 Check out Toya on your next trip to Ubud! Liyer House is perhaps best known as the home of the medicine man Ketut Liyer, featured in the film adaptation of Elizabeth Gilbert’s Eat, Pray, Love. It’s perfect for those who want are on their own Eat, Pray, Love journey, as well as those looking for an affordable yet quality stay in Ubud, Bali. Liyer House has clean rooms, outdoor cottages for breakfast and hanging out which faces a lovely infinity pool. Personally, what we love about the Liyer House is their spa services. It’s cheaper compared to others in Ubud and relatively easy to reserve even within the same day. 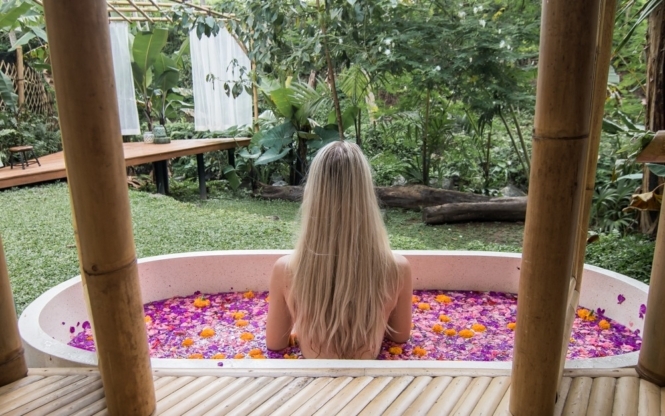 If you’re looking forward to a relaxing massage and flower bath, this is certainly a good choice! The Liyer House is about 5-10 min by car from the Ubud center so it’s quiet. There are restaurants just walking distance from the resort. Finally reaching the guest house address after a hot walk through tourist streets and turning onto a not-so-upscale side street making me wonder if I was going in the right direction, I stared at the steep, broken stone stairs. Radar up, I slowly climbed those stairs… into the most luxurious budget experience I have had in all my travels! A quiet world enveloped me with palms, ponds, lotus flowers, and peace at the Ayu Duwur Beji Guest House. The 4-poster bed, antique furnishings, and a huge tiled bath with walk-in shower made up my room. Total privacy but with an open veranda steps from a sparkling pool, surrounded by statues and lounge chairs, allowed me to be alone or social. Breakfast, included in the price of $33/night, was served on my veranda. Staff was attentive, even arranging a tour and return bus for me. Never judge a hotel by its stairs! Amed is the name of a town, but also of the area that covers seven fishing villages on Bali’s east coast (Amed, Jemeluk, Bunutan, Lipah, Selang, Banyuning and Aas). 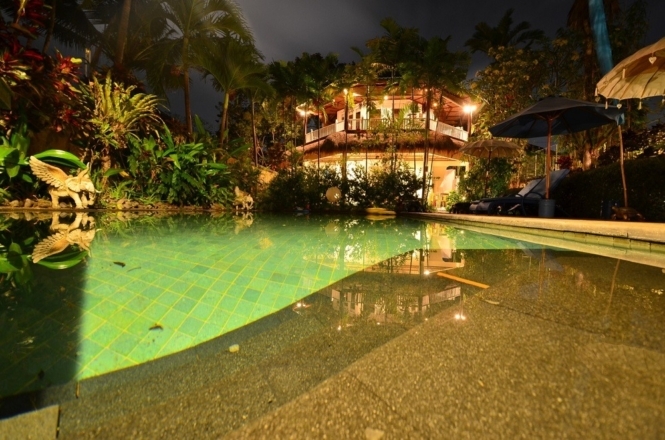 Lovely boutique resort Anugerah Villas is located in Bunutan Village. The lush garden setting really has that tropical Bali feel. Both the rooms higher up the hill and the breakfast area have amazing views. Breakfast was very affordable and good. The resort is just across the street from the beach and also has two small but nice swimming pools. The rooms were spotless and each has a small terrace. The staff at Anugerah Villas is incredibly helpful and friendly. We really enjoyed our stay here. On Booking.com only the garden view rooms are available, but the resort also has slightly more expensive ocean view rooms. Depending on the season, prices range between $20 and $40 for a double room with breakfast. We stayed in Gajah Biru around mid-October three years ago after spending a month in Indonesia. Our welcome was nothing short of spectacular, being gifted a couple of metal customized name signs and a cold drink. Our room, with its very own bar and pond overlooking the large swimming pool, had many unique design details and all the amenities one could wish for (even reading glasses!). The bathroom was spacious as well, with a bathtub and a shower with pebbles on the ground, and the tasty breakfast was delivered on time every morning. We spent a fair time in the pool and the gardens as this property has everything you could wish for without leaving the premises. Finally, let me tell you the restaurant is a great addition and their pizzas and Indian food are just delicious and make an excellent dinner choice. This will be our mid-range reference place to stay in Ubud for our returning trips there and we can’t stop recommending it. Seriously, a great value and one of the best choices in town! 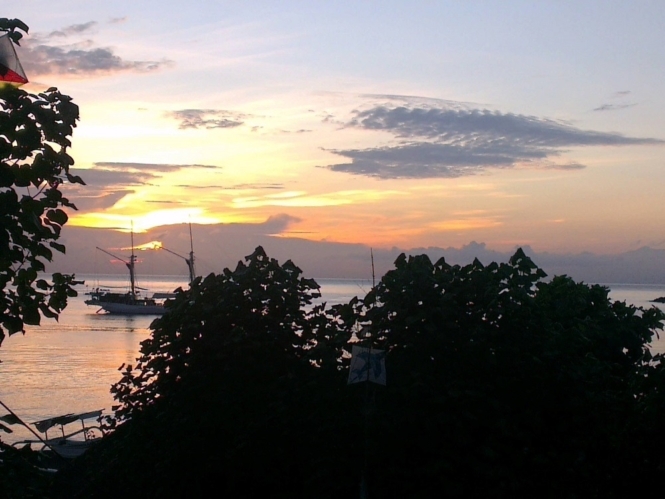 If you are looking for peaceful and affordable accommodation in Bali, cruise over to Amed on the east coast. This relatively undeveloped 14km coastline of laid-back fishing villages offers charming cafés, renowned scuba diving sites and beautiful black-sand beaches. After visiting a number of guest houses in Jemeluk village, I can heartily recommend Dharma Yoga. This small homestay is clean, attractive and great value for money. 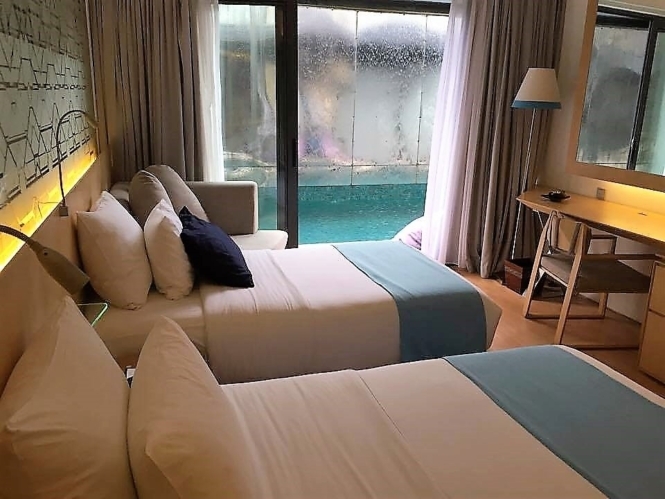 With super comfortable beds and that all-important reliable WiFi connection, the rooms have a calming zen-like quality. You will be hosted by the kind and professional manager Ketut, who provides a daily cleaning service to your liking. The upstairs rooms benefit from a large private balcony with views over the sea and, if you wish, you can wake to spectacular sunrises. Your day’s toughest decision will be what to choose from Ketut’s delicious breakfast options. To enjoy an authentic, relaxing stay, Ari Putri Hotel is the recommended one in Sanur, Bali. The Balinese stone carving design of the entire hotel is eye-catchy and located very near the Sanur Beach. The mid-range Ari Putri Hotel offers all standard amenities for their guests. I’ve enjoyed my comfortable six nights stay at Ari Putri Hotel. Their outstanding service towards everyone is remarkable. Moreover, it varies season wise. Every room comes with a balcony and the garden view. There are restaurants, indoor swimming pools, bar, massage & spa and fitness facilities inside the hotel compound. The buffet breakfast is complimentary, and you can access free Wi-Fi everywhere in the hotel. The best part is everything maintained very nicely, and it was safe to stay even solo. Ize hotel is located smack bang in the middle of Jalan Laksmana, also known as ‘Eat Street’ in Seminyak. This is where many of the very best bars and restaurants on the island are located with many other fantastic ones located in the lanes and jalans nearby. Ize is only a few years old and apart from a great location it is well appointed, has very comfortable rooms and beds and — best of all — there are two swimming pools including a rooftop pool that is under shade and therefore remains cool and refreshing all year round (something many Bali pools struggle with). If you book a room on the lowest floor you also have access to another pool shared with only 3 other rooms. And on top of all this Ize is also at a great price point for much of the year. I’ve stayed here several times and recommended it to many. Ubud Dedari Villas is one of the nicest places to stay in Bali. Located in Bedulu, at 20 minutes drive from Ubud, this wonderful boutique hotel is perfect for travelers who are looking for a quiet place to stay that, for a more than reasonable price, offers all amenities. 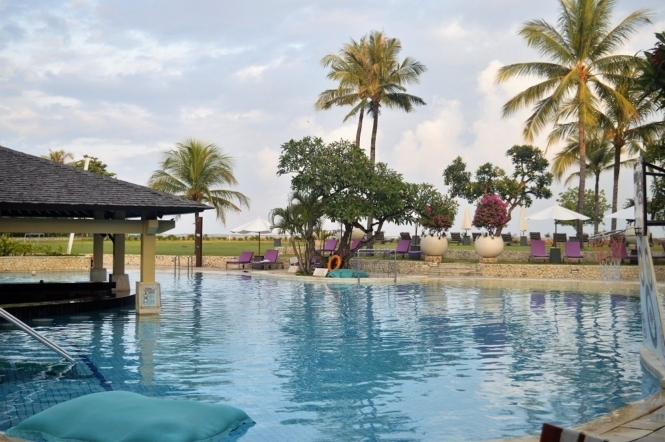 The Holiday Inn Baruna is located directly on the Beach in Tuban, just south of Kuta. It is a quiet location with only a few shops and restaurants nearby. However, it is only a 15-minute walk to the heart of Kuta. The hotel is set among gorgeous tropical gardens and has a large lagoon-style pool, with swim up bar, looking out over the beach. 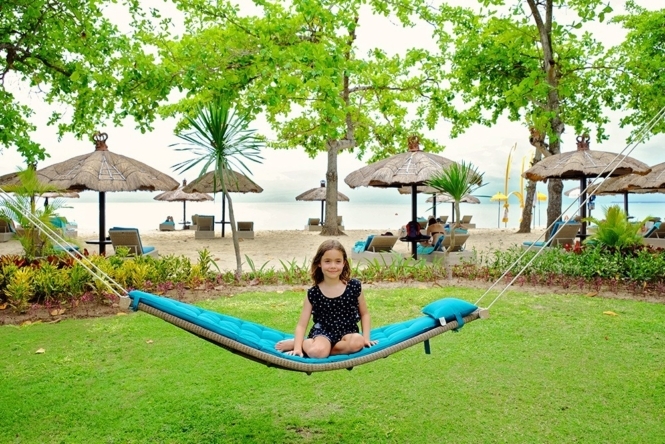 The hotel also has an on-site spa, 2 restaurants, café, ice cream parlor and kids’ club. I recommend staying in one of the pool access rooms. These rooms are on the ground floor with access directly from the balcony to the swimming pool only a few meters away. This hotel suits families or those wanting a quiet location but still within walking distance to Kuta. If you’re seeking a relaxing jungle getaway, I can highly recommend you to book your stay at Hideout Lightroom in Bali. Hideout Lightroom is located 2.5-hour drive from Seminyak (1 hour from Ubud) in a small village near Selat. Here you can enjoy the rural part of the island with its beautiful nature and friendly locals. Hideout Lightroom is an eco building totally made out of bamboo and is handmade by the locals and owners — which is very unique! This is the place you want to visit if you just want to disconnect from everything and have a moment to yourself. Sip on your morning coffee and listen to the sound of the birds by the river, take a shower outside while watching the wildlife, and just sit back and relax with a good book and forget about social media for a while. It’s the perfect experience for anyone who likes to be adventurous, and those who aren’t extremely afraid of bugs, dogs, and cats. Remember this is not a 5-star luxury hotel, it’s a unique AirBnB rental. If you want to stay a couple of nights at Hideout Lightroom Bali, you have to book in advance since this place is extremely popular. Rates depend on the dates and demand. Bali Eco Stay is easily one of the most Instagrammable accommodations in Bali and quite possibly the most socially and environmentally sustainable. The ecoresort is tucked away off-the-beaten-path deep into the jungle surrounding Batukaru Mountain. Due to its remote locale, Bali Eco Stay is a place to explore in and of itself, and not the ideal location for sightseeing around the island of Bali. 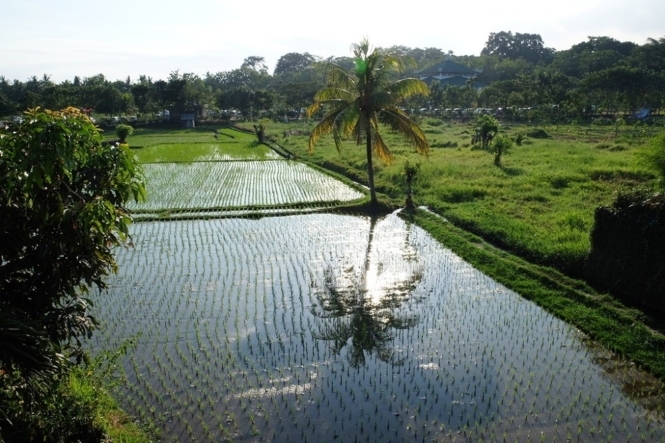 I stayed in the Little Padi Bungalow at the eco-friendly farmstay, which is surrounded by endless rice terraces. The open-air bungalow is two stories with an outdoor bathroom on the first floor and sleeping area upstairs. From the window, I could see the ocean in the distance as I lounged on the cozy daybed, but I preferred the lazy days of watching the rain pour in the jungle and listening to the mystical sounds of nature. 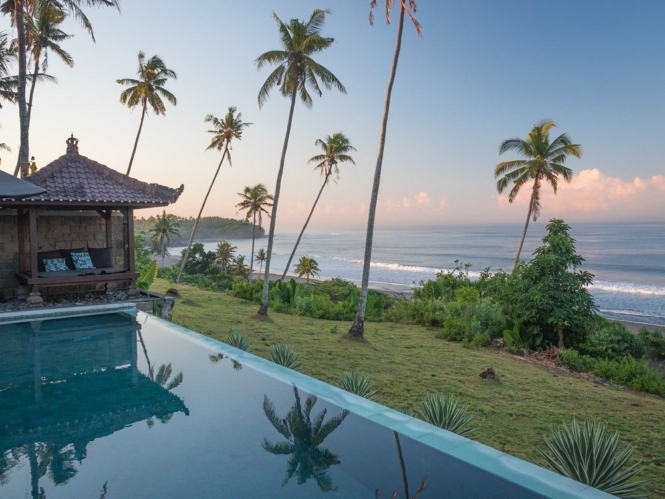 The beautiful SeaBreeze Villa is located on Bali’s west coast in the tiny town of Balian and was an a truly relaxing getaway from the island’s hustle and bustle. The high-end villa is a bona fide 5-star Airbnb accommodation and when we visited it lived up to all the online review hype. The villa has two comfortable air conditioned bedrooms with ensuites, a fully functioning kitchen, WIFI, and a lounge room decked out with all entertainment needed including house-wide speakers to listen to your favorite music. However, we spent most of our waking hours next to, or in, the infinity pool that had amazing views of coconut palm trees and a deserted sandy beach. Or on one of the 3 day beds. The villa comes with staff who cook up awesome breakfasts every day, with fresh duck eggs coming from the small farm next door, and when we didn’t feel like going out at night, they would cook up a feast from whatever was fresh from the market that day. To add to the luxury, we were able to get the services of a spa in the villa and we all received a number of excellent massages during our week-long stay. SeaBreeze is a relaxing Bali beach getaway perfect for honeymooners or for any special trip. 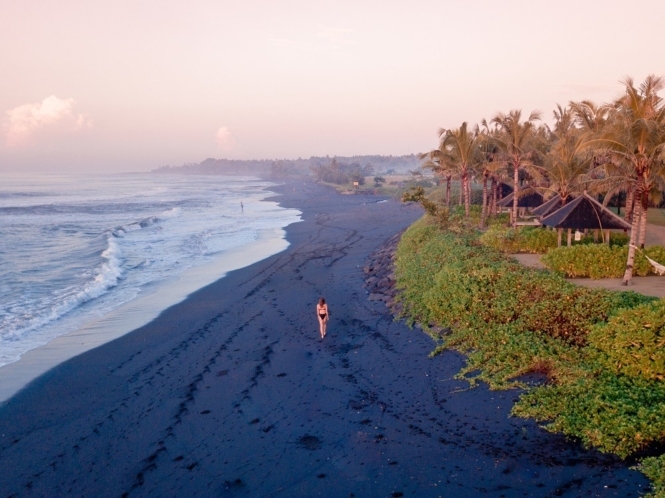 The Komaneka at Keramas resort in Bali is a beautiful hideaway on a black-sand beach that is tranquil, calm and secluded. It’s not always easy to find that kind of thing in Bali, but this particular beach is lesser known, mostly popular with horseback riders and surfers. 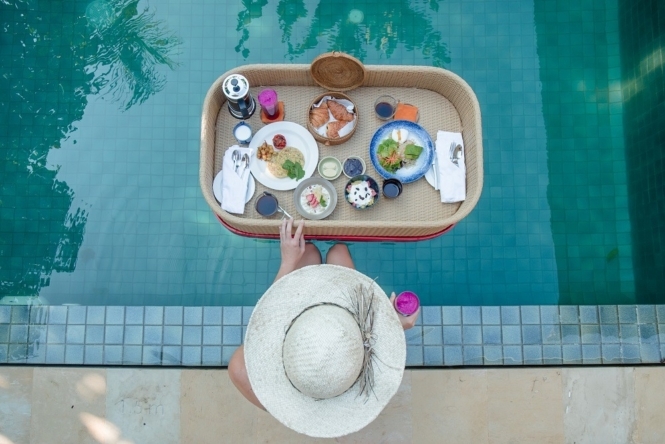 The Komaneka at Keramas is a Balinese-owned villa resort that currently has 9 pool villas — and is expanding — as well as an olympic-sized pool, spa, yoga facilities and a delicious restaurant. It’s focused on holistic wellness and a peaceful, relaxing experience. I just love their catwalk over the rice fields, delicious floating breakfast and opulent rooms. Most of all, I love that it feels so secluded without being hours and hours away from the airport. The moment we drove through the gates of the Padma Ubud I could feel we were going to have an amazing stay. Located a 30-minute drive north of Ubud, The Padma is an oasis from the hectic tourist areas. Set overlooking a river, the views throughout the resort are breathtaking especially at breakfast time and from the gorgeous pool. The rooms are a fantastic size for both couples and families with the club rooms the pick for a romantic trip away. Families are also well catered for with a kids’ club, kids’ pool and food that the kids will enjoy eating. There are so many activities to do at the resort that you will never be bored and a trip to Ubud is easy to organize with the free shuttle bus. I would highly recommend spending at least 4 nights at this resort to experience all it has to offer including delicious food, yummy cocktails and the most beautiful views. The Colonial Villa is perfect for days of pampering and relaxation in Bali. This luxury private villa is located in its own grounds in Sanur. The Colonial Villa was exceptional in every way, a luxurious walled sanctuary. Sleeping up to eight guests in four large, beautifully furnished bedrooms, all with en-suite bathrooms. 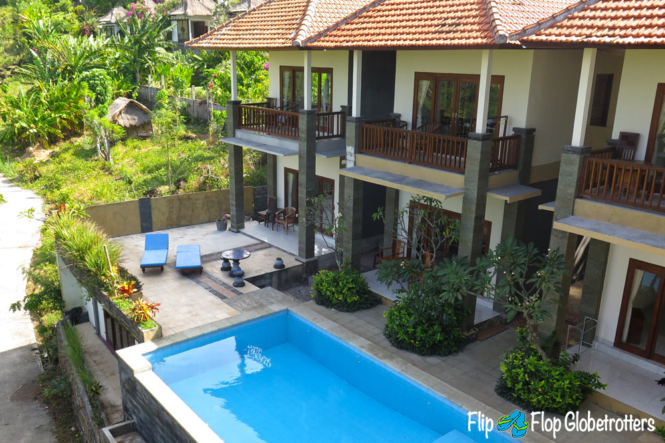 With its own pool, garden and open sided Balinese living, we barely left the villa. Ketut and his team, who manage the villa, are sublime, super helpful and attentive, but also inconspicuous. Meals can be provided and we recommend you try them as they were superb and reasonably priced. 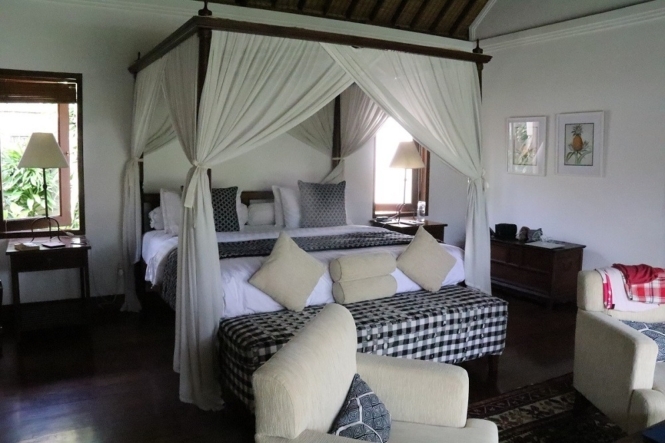 The Colonial Villa is perfect for a family holiday or a group of friends holidaying together. It is a luxury option in Bali. Belmond Jimbaran Puri Bali Resort is an oasis like no other. 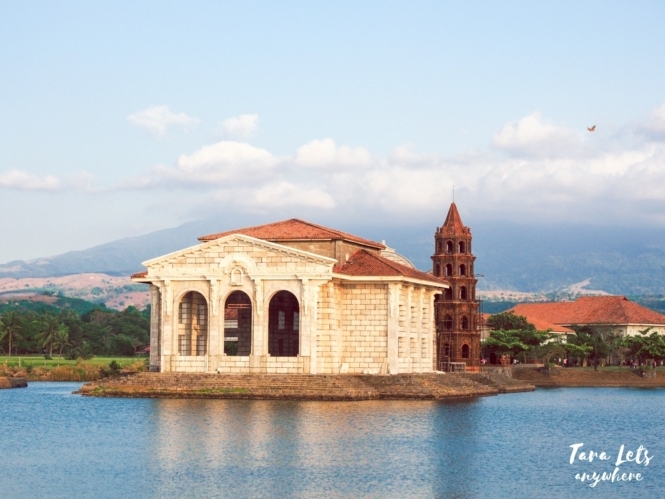 This place caters to all types of tourist: singles, couples and family travelers alike. If you are a family like us, then our recommendation would be to stay at the super-luxurious two-bedroom deluxe pool villa. This is a magical way to spend a holiday. Your villa consists of two separate houses, one for parents and one for the kids, and of course there is a private pool here as well. The private villas even comes with your very own butler! The resort will keep you busy for days. If the beautiful views of the beach from an infinity pool are not enough for you, there are plenty of activities that you can choose from as well. You can choose to take part in cooking classes, go on an informative trip to the local markets, get arty while painting traditional eggs or learn how to dance Balinese style. Belmond Jimbaran Puri Bali Resort is one of the best Bali hotels for families. When you stay here yourself, you will remember the bliss and relaxation forever. A short walk off the main drag in Ubud, Kano Sari Ubud Villa is a lovely and tranquil place to stay. The rooms and gardens are beautiful. The resort is small, with only 5 rooms. Wifi and parking are free, although the Wifi only worked in the main house when we were there. Breakfast is delightful. They catered breakfast to your delights. When they discovered that I loved mangosteens, they had a whole plate ready for me the next day. Kano Sari distinguishes itself by excellent service that goes above and beyond. Karen, the owner is very involved. One of the staff told us about a festival happening at the Hindu temple. He was participating in the ceremonies and suggested we attend. Since it was too far to walk, two of the staff promptly brought out motor bike and ferried us to the temple. Karo Sari is on the more expensive side for Ubud. We paid just under $600 USD for two rooms for three nights ($100 per night per room). Rooms are large and well appointed, with a rain show and large bathroom. The Legian Bali is one of my favorite resorts in Seminyak. It’s located next to the beach and you can choose to stay in a villa or suites. We stayed in both, just to get the full experience, and their villas are amazing. The villas comes with a pool, outdoor bathtub, sunbeds, tables and the best part is the fact that you can be served a freshly made breakfast by the pool. This resort caters to luxury travelers or honeymoon couples who want to relax and have a romantic stay in Bali. The inside of the villas is fantastic as well with a comfortable bed, spacious living room, desk, bluetooth speaker, big bathroom and a free minibar. I really loved to have my own private pool and the outdoor bathtub was very romantic in the evening. The villas are very private as well, and if you need anything you can just call the room service and they’ll arrange it quickly. It’s also just a quick walk from the beach, and if you want to spoil yourselves a bit there’s a great spa section in the main hotel building as well. The Legian Bali has everything you could wish for when it comes to a romantic and luxurious hotel stay in Seminyak. P.S. Going to Bali soon?